Robert Mugabe’s former deputy, Joice Mujuru, yesterday told an evicted white farmer in London that she will pay him more then £1m for “damages” caused by her late husband when he invaded the farm 15 years ago. Mrs Mujuru’s husband, General Solomon Mujuru, sold Guy Watson-Smith’s valuable tobacco crop on the Harare auctions four months after he took over the farm. He also kept various pieces of Mr Watson-Smith’s private property, including farm equipment. General Mujuru was one of Mr Mugabe’s closest associates at the end of the Rhodesian war and led the new army after independence in 1980 but quit government a few years later to go into business. He died in a mysterious fire on the farm from which Mr Watson-Smith was evicted, and his widow, Joice said openly at the time she believed he was assassinated. 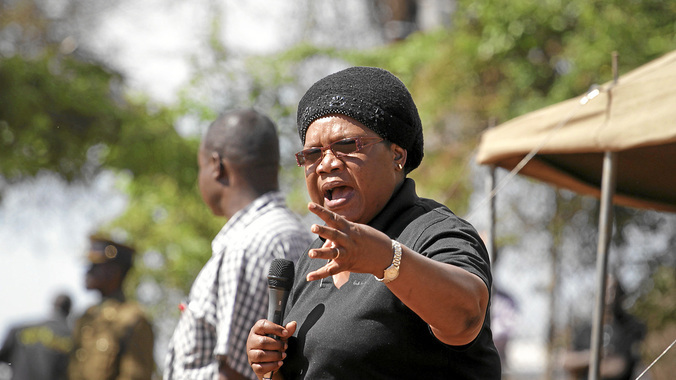 Mrs Mujuru, 61, was kicked out of her post as vice president of Zimbabwe in 2014 and has recently launched her own political party, People First, as she positions herself as a future contender for the presidency. She says she will stand against Mr Mugabe, 92, at elections in 2018. Mr Watson-Smith, who now lives between the South of France and Cape Town, appealed the eviction at Harare High Court, which last year awarded him damages of more then £1m including revenue from the tobacco crop sold by General Mujuru months after he seized the farm. Mr Watson Smith, who was one of Zimbabwe’s most successful tobacco farmers, told the Telegraph earlier this week that he was willing to meet Mrs Mujuru if she was prepared to discuss payment of the debt. Previously he had accused her of being “seem(ing) quite happy to remain a convenient beneficiary of the regime’s violent past”. It is believed to be the first time an evicted white farmer has received compensation for property taken by a senior regime figure, at least publicly. Mr Mugabe approved land invasions after he suffered his first political defeat in 2000, and about 3000 productive white farmers were evicted in the next few years, leading to Zimbabwe’s economic collapse. Alamein an area of Zimbabwe which General Mujuru claimed originally belonged to his ancestors before Cecil John Rhodes and his associates took the territory more then 100 years ago. Mrs Mujuru, who went to war to fight against white minority Rhodesian rule in the 1970s, said in London that she wanted to meet Mr Watson-Smith and pay him what he was owed. She said that she regretted many policies of Zanu PF including political violence and farm invasions. After the pair met, lawyers for both sides were contacted to make arrangements to settle the debt, with interest.